The first winner of Seattle Public Theater’s biennial Emerald Prize for new plays, "Fire Season” ambitiously tracks numerous narratives of collateral human damage from the deadly epidemic in rural Washington state. 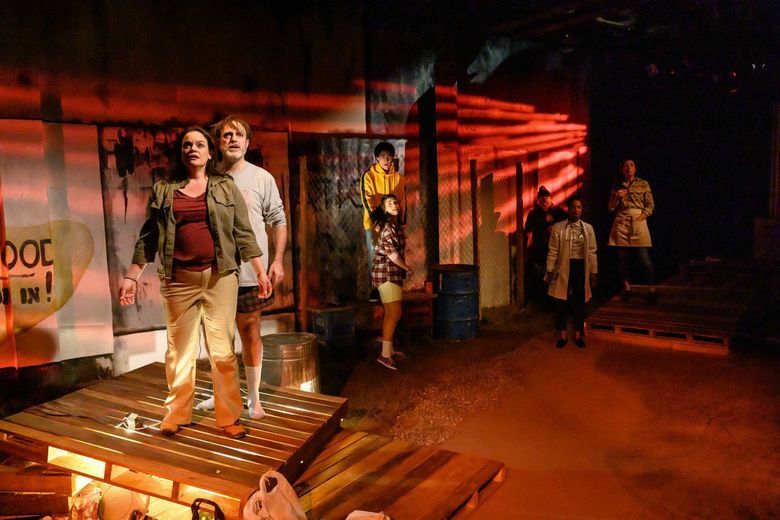 Located in a dreary, unnamed town somewhere in rural Washington state, the multi-stranded story in playwright and TV writer Aurin Squire’s “Fire Season” isn’t so much about opioid addiction as it is about the collateral human damage of the deadly epidemic. Squire’s new play splits its focus between the mother of a child lost to drugs, a recovering military veteran trying to reassemble his broken life, a dedicated physician who is one of the few African Americans in town, and a pair of teenage lovers facing an adult conundrum. In Seattle Public Theater’s world premiere of the script, these characters are erupting, to varying degrees, with strong emotions: grief, anger, fear, regret. And when the phrase “What’s past is prologue” pops up, some interpret that famous line from Shakespeare’s “The Tempest” to mean the future is what you make of it — while others think it means your history is doomed to repeat itself. The first winner of Seattle Public Theater’s biennial Emerald Prize for new plays, which carries a $10,000 award, “Fire Season” ambitiously tracks numerous narratives. It dashes between multiple scenes unfolding (and at times overlapping) under SPT artistic director Kelly Kitchens’ sprawling but cogent direction. Liz (Kathryn Van Meter) is the anguished mom obsessively, quixotically determined to have an American flag fly at half-mast to honor her dead son. Boiling mad at the world, she can make the Frances McDormand character in the movie “Three Billboards Outside Ebbing, Missouri” (another tale of a bereft parent on a mission) look like a pussycat. Curtis (Mike Dooly), a sincere, volatile former schoolmate of Liz, tries to do the right thing and is frequently interrupted by the pinging of a dysfunctional battery in the ankle bracelet he wears. And Liz’s surviving teenage son Ricky (Pablo Lopez) and his girlfriend Jessamyn (Sofia Raquel Sanchez) are essentially good kids stuck in a bad situation. The fact that some of the above are peddling the kind of drugs that killed 12-year-old Eli, Liz’s younger child, is framed as one of the few ways to earn more than minimum wage out there in the boonies. And it’s no surprise that local physicians like the meticulous Dr. Cormack (Dedra D. Woods) are suspected of doling out too many painkillers to their patients. “Fire Season” generously empathizes with all of these people, and it’s not without dashes of dark humor. But the play spreads their stories very thinly — at the expense of giving us a more revealing, nuanced understanding of them as individuals, or their community as something more than a place people long to escape. This creates some problems for the actors. As Liz, Van Meter lashes out in loud and snarly, profanity-filled outbursts so often it’s understandable why her uptight boss at Walmart (Martyn Krause), a convenient villain here, fires her. As Curtis, Dooly does more with less. Either I missed why Curtis is under house arrest or the playwright hasn’t revealed it. In any case, this compelling actor captures his shame, desperation and grasping for redemption in silences as well as dialogue. Lopez looks older than Ricky’s age, but his moping and back-talk around Liz are convincingly adolescent. (His mom’s barbed term of endearment for Ricky is “f— face.”) And Sanchez lifts a fresh breeze in her animated innocence, and is touching when her naive dreams are crushed. Woods endows Cormack with dignity and compassion. But her role comes off mainly as a narrative device. You want to know more about this black doc’s life in this town — and more about the town itself. Though it is in an area of natural beauty, according to the doctor, designer Julia Welch’s scenic backdrop evokes only an abstractly grim, fenced-in landscape. As for the opioid crisis, it can’t get much grimmer than when 12-year-olds are victims of it. “Fire Season” suggests, as do many experts, that not only physicians and dealers but also drug manufacturers and pharmacists share responsibility for the skyrocketing tally of opioid use nationwide. But we meet no people with opioid addiction in this play, and learn little about what drew Eli into the deadly maze. To comprehend his death, maybe we need to know more about his life — and the town that bred him.